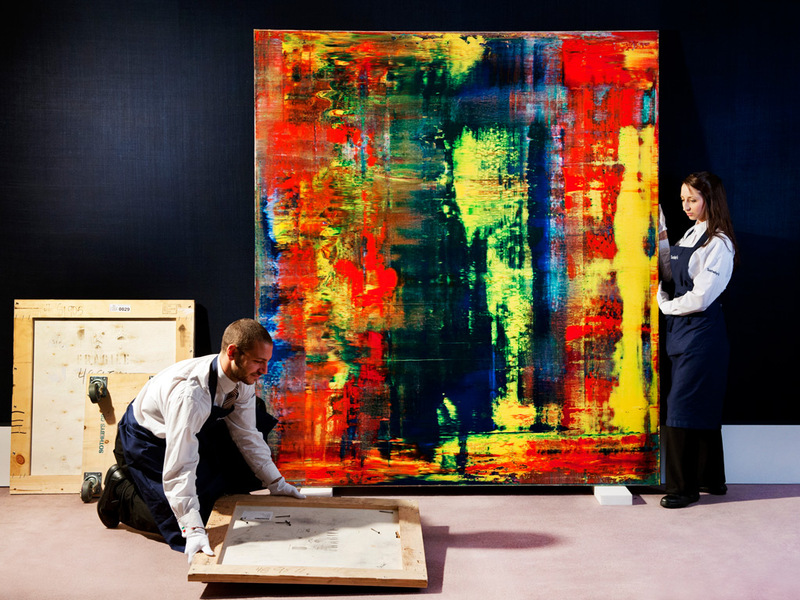 Gerhard Richter abstract paintings auctioned . 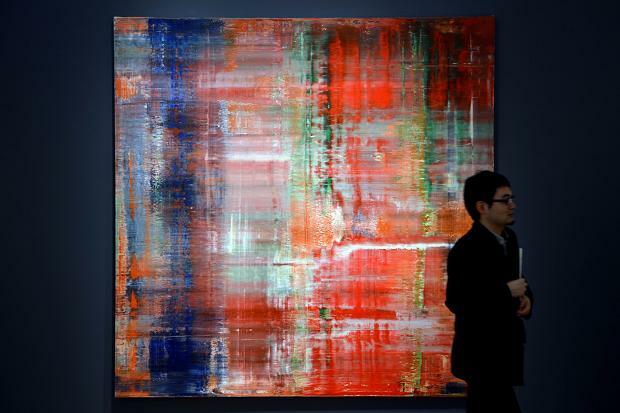 I´ve read this morning at artprice (the world´s leader in art market information), that Gerhard Richter, an absrtract painter I normally talk about, happens to be the the world’s top selling living abstract artist. In a previous post where I showed you some of Richter´s most stunning abstract paintings and I explained that what interests me the most is the free painting technique he uses as well some of the abstract painting series from 1985 onwards (mainly the Abstraktes Bild ones). I believe this abstract painting technique is infinite in terms of potential interesting results. It´s a quite unique and personal way of painting. It would be great to know how did he started using it. Gerard Richter explains here somethings about it. Reading the above 2009 Richter´s interview, you may have noticed two questions he is asked. 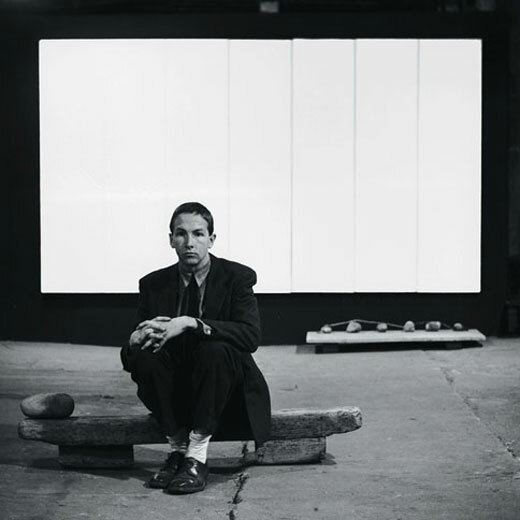 In one, his white abstract paintings (like the one above) are compered with Robert Rauschenberg white paitings series exhibited in 1951 for the first time. He answers saying he did not know Rauschenberg abstract series. He also adds that what he sees on his white paintings it´s not a reduction dealing with the disappearence of painting, instead it has to do with white areas and objects he can not identify. Continuining with the interview, he is also asked if this is a good time for painting. His answer is clear “It’s not. It’s been almost the end of the culture of painting for a hundred years. We have photography, film, installation… You know, I’m the only painter at this gallery. I didn’t realize this until now. All the others are conceptual, and I was struck by this: I thought, it cannot be. While you meditate about his answer (I´ve already done it and do not agree at all), take also a look at this 300 high quality images book called Gerhard Richter: Fourty Years of paintings, one of those books I called a fine art piece on itself. Spectacular book, isn´t it?. In this other article I show you some other abstract art books considered a piece of art. 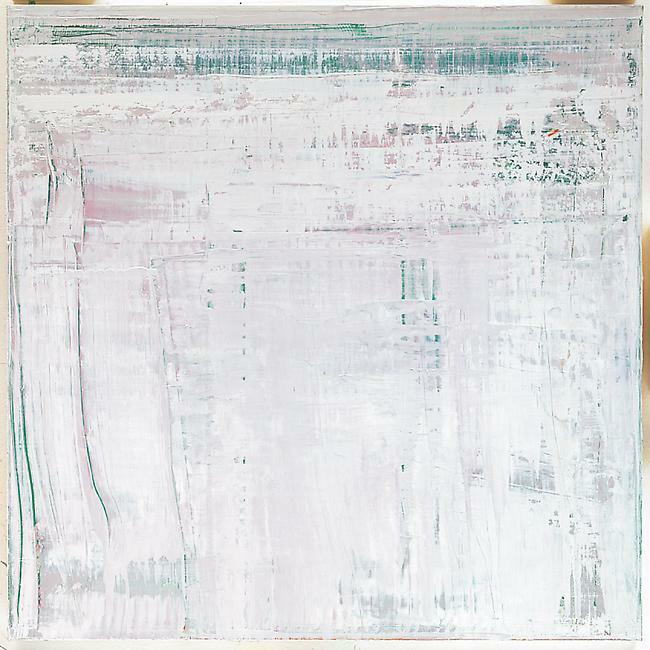 And now take your time and enjoy some Richter´s paintings auctioned in 2012. 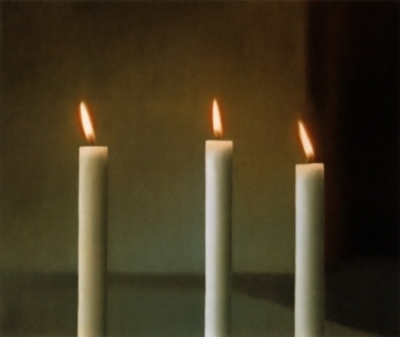 It seems that when G.Richter first exhibited the above candles series, not even one painting was sold. Did you know that Joan Miro´s first important exhition did not sell a single painting either?. Spectacular art, isn´t it?. What an interesting technique! Whant to learn more aboutit ? This video documentary filmed at Richter´s studio in 2009 will show you more. Hope you have enjoyed this article. If so please, share it with whom it may interest. But before finishing, there are a couple of questions I would like to ask you. Feel free to answer them at the comment section you will find below. 2. Do you agree with Richter when he says that this is a bad time for painting and that the culture of painting has been dying for the last 100 yrs?. Thanks for reading and adding your thoughts here, join yasoypintor on facebook or me (Antonio Basso) on pinterest to be updated. 19 Responses to "Gerhard Richter paintings: top selling living artist"
Dude’s got cajones. He deserves his success. Hi Rose, I´m sure he does. Thks for commenting. I do agree with Richter’s statement that it is a bad time for painting. And for the same reasons he sites, photography, film installations, etc. I think it has been a very gradual decline, so gradual that it’s not really awakened the art world to the decline, but society today and the next generation of artists as well as collectors have recognized the artistic validity of these new genres of artistic expression and with the ever evolving technologies at artists disposal it has become a legitimate avenue for artist to create and express themselves in ways that in previous generations was not available. So do I think that the painter is a dinosaur on the way to extinction? No not at all, but there is and will continue to be an explosion of art that is based on the technological developments in the digital age that is being evermore embraced by the new generation of artists as well as collectors. The decline of art has been evident by the dearth of art reviews in mainstream newspapers like the New York Times. It is sad, because there are still thousands of good easel painters. What can be done? Hello Vivian, thanks for your comment. My question for you is what would you do? Hello Scott, a friend of mine told me the other day that his uncle used to say that while imagination persists, there will always be room for evolution. I guess this can also be applied to painting. Despite tecnhologies, photography and the like there will always be room for painting. Today, there are more galeries, collectors, museums, fairs, auctions, and painters than ever in history. This is a fact. Painting is not dead yet but it probably needs to evolve. It’s irrelevant if you apply painting on a surface or express yourself with new technologies. I think the important part is what you say and no how. Art, in all its forms, has been giving way to science in our culture as a better tool for the society to solve problems and doubts as a comunity. It’s no longer an spiritual necessity. Icons belong to the market and not to the souls. Art is not anymore the media that connect thoughts and believes, but the last step where everything ends. Science keeps asking questions and solving doubts that Art can’t simply answer. I agree with you with the importance of what you say and not how you say it. But when what you do to say what you want express is not crearly understood and / or transmited (and here the technique employed plays an important role), then the “what” looses strengh. I certainly believe and have seen, great contemporary artists out there (either figurative, abstract, painters, sculptors, architects ……..) that really say interesting things using classical mecanisms and techniques. Technology is not always necesary. I would say that imagination (what you think, dream …), visual power (what you see) and sensitivity (what you feel) are more important. Anyway, to me painting is not yet dead. Regards and thanks for sharing your ideas. Hello Mel, thanks for adding your vision. I dont agree. Painting will continue while there are painters. Painters arent problem solvers,or scientists, painters are not concerned with truth, their currency is DOUBT. It takes effort and knowledge to be certain, doubt is much more democratic, available to one and all. Hello Williard, I don´t agree with you that painters are not problem solver or scientists. I believe that an artist and a scientist may have many common characteristics. Interesting your point about DOUBT. What do you exactly mean?. Rgds and thaks for joining. I’m somewhat new to painting but not at all noob. I painted at the nineties and stopped for quite a while and I swear to god that I never knew Richter nor I ever seen his work of art. But somehow, I was using the same technique back then unless he’s using a oversize squeegee and I was using pieces of paper to rub the colors like he did. And his paintings sold for millions of dollars. I’m a bit disappointed, he was painting when I wasn’t even born so technically, it’s his technique I was using. No wonder not even one painting of mine could ever be sold on the art market and I stopped using the technique since. People wanted to see something new, something they never see in their lifetime. However, I’m still struggling in the battle for selling my paintings at the moment although the price tag is not more than 200 bucks per piece. Well, talking about fate. Hello Tony, I perfectly understand what you mean. Sometimes it´s not only the technique that counts the most. There are many other variables that determine the capacity to sell or not to sell and art work. Time consistency; innovation; public relations; how, when and through who you market your art, luck … Keep going!!! Gerhard Richter is without question great artist (look at his website). But what this has to do with the last Sotheby’s sells? They will sell your old sofa if there is some body to buy it. People do not understand that art is a social relation and need for beauty. Who cares for this specific abstract painting which wall will decorate? (except Mr. Richter). After selling his works so successfully, he will be the same looking for experiments artist, and that is the “no death of painting” which is really the great of this “profession”. Is simple, Art of Painting will be. Thanks for sharing your thoughts Nedko.